No E-Fauna image is available for this taxon. Distribution of Sorex bendirii in British Columbia. Click on the image(s) below to view an expanded illustration for this taxon. The Pacific Water Shrew is the largest shrew in the province. It is an attractive mammal, with dorsal fur that varies from dark brown to black, and dark brown ventral fur that does not contrast sharply with the dorsal fur. The tail is a unicoloured dark brown above and below. The feet have a stiff fringe of hairs about one millimetre long, although the hairs may be missing on old adults. 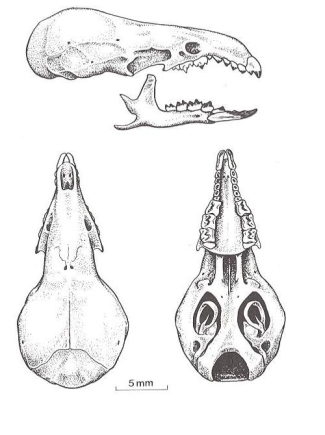 The relatively large skull has a rostrum that is curved in ventral profile. There are five upper unicuspid teeth; the third is distinctly smaller in size than the fourth. The upper unicuspids have a pigmented ridge that extends to the cingulum. The upper incisor has a large medial tine that is positioned within the pigmented region on the face of the incisor. 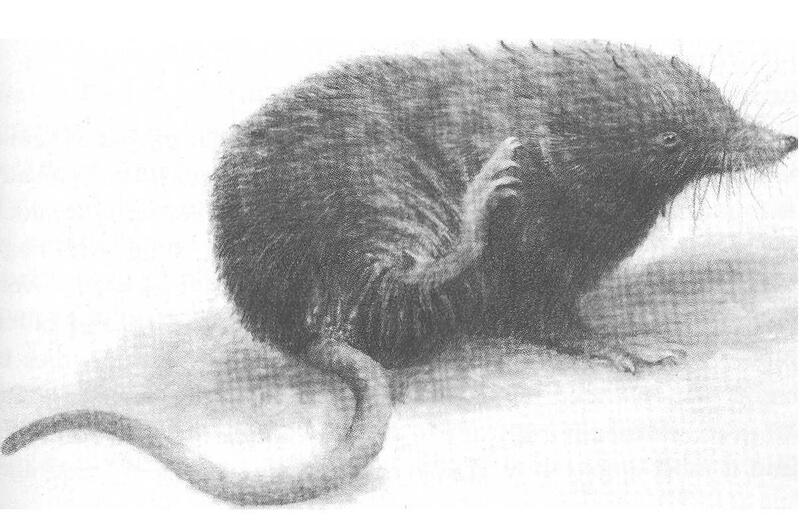 The large body size (total length greater than 130 mm; hind foot greater than 18 mm), large skull (skull length greater than 19.0 mm; palatal length greater than 8.2 mm) and the fringe of stiff hairs on the feet distinguish the Pacific Water Shrew from all our shrew species except the Water Shrew (Sorex palustris). The Water Shrew can be identified by its dark grey to black dorsal fur with a silver-grey belly, a bicoloured tail that has a paler underside, and a longer, more conspicuous fringe of hairs on its feet. The skull of the Water Shrew is smaller, does not have a ventrally curved rostrum, and has upper incisors with indistinct, medial tines. Several nests have been found in the wild, all constructed from shredded bark. There are no breeding data for the Pacific Water Shrew in British Columbia. In other parts of its range, the breeding season extends from late January to late August, with most young born in March. The litter size is three or four. The number of litters produced by females has not been documented. Males do not breed in their first summer. 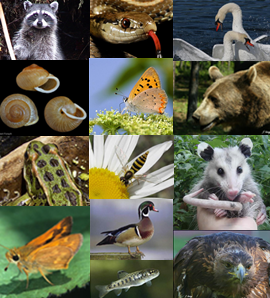 This shrew's diet is rather specialized, consisting of aquatic insects (water beetles and the nymphal stages of stoneflies, mayflies and alderflies), craneflies, ground beetles, spiders, harvestmen, centipedes, earthworms, slugs and small terrestrial snails. Aquatic insects may account for 25 per cent of the prey types eaten. Much of what we know about the feeding behaviour of this species comes from Donald Pattie's observations of several captive individuals. Pattie's captives fed readily on earthworms and termites, attacking earthworms ferociously with a series of swift bites along their bodies, and tearing apart pieces of rotten wood with their teeth, then pushing their long snouts into the termite tunnels. When hunting under water, they seized an animal in their jaws and carried it to land before eating. The Pacific Water Shrew probably relies on touch to detect prey under water, using the sensitive vibrissae on its long snout. Evidently this shrew will cache excess food. Pattie's captives deposited excess earthworms in a corner of the cage to be consumed later. Throughout its range, the Pacific Water Shrew appears to be rare. There are no actual estimates of populations, but in most small mammal studies, it represented less than one per cent of the small mammals captured. In 1992, Carlos Galindo-Leal and Gustavo Zuleta conducted an intensive survey of this species in southwestern British Columbia using more than 19,000 trap nights in 55 locations. They captured nearly 1,000 small mammals, but only 3 were Pacific Water Shrews, taken at 3 widely separated locations. The only shrew with similar aquatic habits is the Water Shrew. Competition between the two is probably rare in British Columbia. Although they co-occur at a few locations (e.g., Haney and Cultus Lake) their distributions in southwestern British Columbia are usually separated by elevation, with the Water Shrew inhabiting areas above 1,000 metres. A semi-aquatic species, the Pacific Water Shrew can swim for several minutes underwater or on the surface, propelling itself with alternating movements of the hind legs. Waterproof pelage keeps it warm in water, and air trapped in the fur provides buoyancy. Evidently this species can run for several seconds across the surface of water. Several specimens captured during recent environmental surveys near Sumas Mountain were taken inadvertently in submerged minnow traps set in small creeks. No studies have been done on predation, but owls, the Pacific Giant Salamander and fish are the most likely predators of this shrew. The Pacific Water Shrew is a habitat specialist that occurs in moist riparian habitats associated with stream sides and marshes. Typically it is found in forests of Red Alder, Bigleaf Maple, Western Hemlock or Western Red-cedar that border streams and Skunk-Cabbage marshes. These habitats usually have an extensive canopy cover, abundant shrubs and a ground cover of woody debris and fallen logs. Its relationship with forest age is not clear: several studies in Oregon demonstrated that the Pacific Water Shrew was most abundant in old forests; but a study in the Cascade Range of Washington found it most common in younger forests. Regardless of forest age, it is strongly associated with moist environments. The Pacific Water Shrew is less dependent on standing water than the Water Shrew. It has been captured in dry forests well away from water; during the dry summer months it is usually found within 200 metres of streams. The Pacific Water Shrew may inhabit localized patches of suitable microhabitat. At Point Grey, near the University of British Columbia, nine were captured just above the tide line in beach debris near small pools created by springs. This species was collected at 850 metres elevation in Mount Seymour Provincial Park, but in British Columbia it is generally restricted to low elevations, with most occurrences below 600 metres. The Pacific Water Shrew inhabits the coastal lowlands of northern California, Oregon, Washington and British Columbia, where it is restricted to the lower Fraser River valley. The eastern limits of its range are the Chilliwack River and Agassiz; the northernmost records are from low elevations in the Coast Mountains on the north shore of Burrard Inlet. Three subspecies are recognized. The British Columbian population is classified in the subspecies S.b. bendirii (Merriam), a small form found in western Washington (excluding the Olympic Mountains) and southwestern British Columbia. The provincial Ministry of Environment has placed the Pacific Water Shrew on its Red List and COSEWIC (Committee on the Status of Endangered Wildlife in Canada) listed it as threatened in 1994. Because it occurs in low numbers, is a habitat specialist, and has a range that coincides with the most heavily populated urban centre in the province, the Pacific Water Shrew is threatened by habitat loss from urban growth. The recent survey conducted by Carlos Galindo-Leal and Gustavo Zuleta confirmed that it is rare in the province. The three animals captured during their survey were found in three widely separated localities (North Hoy Creek, Coquitlam; Davis Creek, Dewdney-Alouette; Fergus Creek, White Rock). Historical records suggest that the British Columbian population has declined. Since the first museum specimens were taken in 1888, 115 specimens have been taken at 27 localities. However, only 15 Pacific Water Shrews have been captured in the last 40 years and some of the historical collecting sites are in areas that have been modified by urban development.